Postcard Trip Status: Visited! Click this link to read on the trip. As you may know, the north sea of Lovina is the home of many dolphins. To see the dolphins we have to leave the beach around 6 a.m. to go to the sea by a traditional fisherman boat. It takes around 20 to 30 minutes to reach the dolphin’s area. When the sun rises, there will be dozens of dolphins appear, jump out of the sea. It’s fun! It will be more fun if there are less tourists coming to see the dolphins. If there are too many tourists, the dolphins will be scared and less of them appear. Beside the dolphin watching, Lovina also has vineyards. On the harvest time, it is fun to see the vineyards. They will be produced for Balinese wine. The high season period for European tourists to visit Bali is about to end. Most likely, I will have more time to relax. It would be great if you can come to visit me. I have visited Bali for many times, but have never been to Lovina. This is such a lovely postcard. 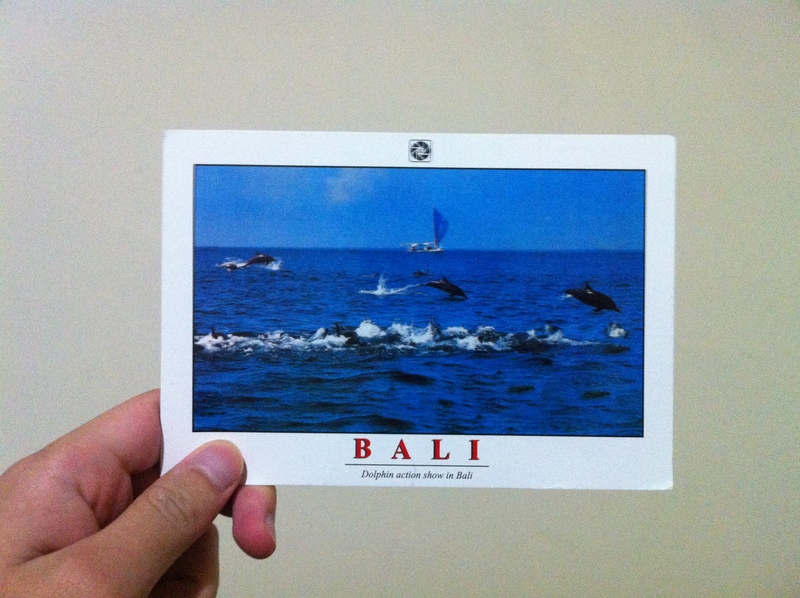 Not only because it is the first postcard I received from Indonesia, but also because of the story that Gigih shared to me. It helps me to picture the beauty of Lovina where dolphins are having fun when sun rises. If you are curious to know more about the dolphin in Lovina and other tourist attraction around the area, please click here or you can contact Gigih on gigih.rahmatika@gmail.com for help.